Do You Really Need To Rip Off Other People’s Stuff? One thing about the game of golf that I like is that it is indeed the gentleman’s game. Each player is really playing themselves against the course. And because of golf handicaps, it’s possible for a club golfer and a tournament professional to play together and both enjoy the day. There’s a respect amongst golfers shown to each other that is often lacking in the real world and in the business world. There is never any road rage on a golf course. There is courtesy amongst golfers to play in turn, and to never tread or step on each other’s lines and through lines while on the greens. In business, these courtesies shown amongst golfers are often discarded. These courtesies are often considered a sign of weakness in business, a sign of vulnerability. These courtesies, when offered out, are often seized upon by pariahs and sharks in business whose only means of succeeding in business is at the expense and the demise of other businesses. Isn’t there a thought of ABUNDANCE out there in the marketplace? If only we as dentists were to grow the pie, then there would be more pie to share amongst us? 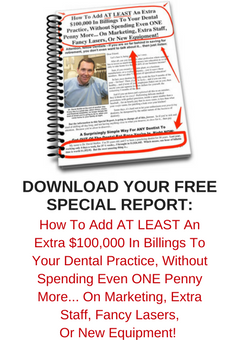 When you look at how many dental offices copy or vary slightly on other dental office names…. It’s like the People’s Front of Judea and the Judean Peoples’ Front…. it’s laughable. When you consider how many words there are in the dictionary, it’s a wonder at all why there needs to be a copy of someone else’s brand…but yet it goes on and on and on on a daily, weekly and monthly and annual basis. It’s enough to make me want to bypass Chatswood and head on up to Roseville…. It’s fifty shades of vanilla…. But it’s not just dentists….even consultants like to rip off other consultants’ IP. I have The Ultimate Patient Experience. Others have even just blatantly used my Trade Marked Brand… all three words. Couldn’t you be more original? My next public speaking presentation showing Dentists how to grow their Dental practices will be in London England on Saturday 4 August 2018 with Jayne Bandy. .For more information and to secure your seat click this link here. Are You Living It Or Acting It? I often see people who say one thing and then behave in an opposite manner. Years ago I remember hearing radio superstar Doug Mulray announce to his listeners that an actor who had made a name for himself in a TV advertisement for a Commonwealth Bank Credit Card had been seen lining up in a nearby branch of St George Bank. It kind of spoils the illusion. But the truth can also hurt. In which case, if someone is “living the lie”, then the truth will catch up with them in the end. It’s the same with “expertise”. When you’re purporting to be the grand master of your industry, then it doesn’t make sense when you are seen to not care for those with whom you should be caring for. One of the great things I have learned from looking outside of my own dental industry is that those who hold themselves out to be great do indeed need to be acting with compassion and interest for those who seek their attention. I’ve marveled at the extents that greats like Gene Simmons go through to always ensure that fans are attended to. We’ve all heard about star performers and sports people who are too busy to give autographs to their adoring fans. And God forbid, there have been reported instances of fans who have been mistreated in these instances. The true champions will always MAKE the time and TAKE the time to ensure that the fans receive what they have paid for. And that is an *EXPERIENCE*!! Life is all about experiences. When you need one, you hope that you receive one. And when you’re giving them out, make sure that your heart and your mind are both in it. Be the person you make out that you are! And be the best person you can be….. I so often see dentists who try to be everything to everybody. And they succeed in being nothing to anybody. Least of all to themselves. They succeed in failing to amount to anything. Because they’ve been running around trying to please everyone. Sometimes you have to choose your path. You need to decide where you want to be. But you can’t be on the left bank of the river and the right bank of the river at the same time. If you try to flip-flop your way around without taking a stance, you’ll end up getting nowhere…. FAST!! At least you’ll find out a lot quicker than if you don’t make a decision at all. In today’s dental market, a lot of dentists feel that they need to align their dental offices with an insurer who is magically going to feed their practice with an endless stream of patients needing dentistry that will be either paid for or subsidised by the insurer. A river of gold…. patients with problems being magically directed to your office. No more need for marketing. The insurer will be providing you an endless stream of high quality patients. In fact, you won’t need to advertise for other “private” clients because you are going to be so busy with this never-ending stream of patients. Until the insurer decides to tell you what to charge. Or the insurer decides that they’re going to slash what they’ll pay you. Recently an insurer in the USA suggested to its member dentists that they [the insurer] was going to reduce payments back to the dentists by some thirty percent. You see, the insurer was keen to offer to the market what we call “junk policies” in an effort to attract low end members. Why would any of the dentists working with this company be surprised at its new direction of slashing payments to dentists? You certainly didn’t need to be Nostradamus to see this one coming…. it’s like the old Scorpion and the Frog story. So, my question to you is, are you trying to please everybody across the board, or just the customers that you really want to be dealing with? What you need to do is construct your dental practice in a way that it attracts your ideal patient, but it repels those patients who you don’t like dealing with and who mess up the processes that work well in your business with those ideal patients that you prefer to work with. You see, most dentists only think about the number of new patients and not about the type and the quality of those patients they are attracting. You see, you can’t please everyone, so why not simply be more specific and attract only those people that you prefer to do business with and who value what you do. Life is so less complicated when you focus on pleasing those specific people who you are trying to attract and keep and who you prefer working with, rather than simply trying to attract more of the wrong type of patients. Recognition. Is It Your Mantra? It doesn’t take much to be better at customer service than you are, but it does take effort. And that’s where most businesses fall down. When I am asked this question I feel frustrated. Would you rather be ignored? Would you rather be asked a question? Or would you rather receive a glancing look down the nose? The thing is, a smile is inexpensive to give, but the benefits of giving someone an acknowledging smile are dramatic. A smile sent is nearly always reciprocated. Receiving a smile is uplifting. Babies cry for it and grown men die for it. Are you recognising the presence of your customers? Why would you keep your head buried behind a reception desk or a computer monitor when a living, breathing person walks into your dental front office? And that living, breathing person is more than likely going to pay your office some money, which will help pay your salary? Wouldn’t it make sense to then treat that living breathing person with some respect, by acknowledging them? So that they became a regular customer, and hopefully one day a loyal patron of your business who stays, pays, and refers? When you fail to acknowledge you pure and simply offend. Why would anyone choose to act this way? When you pass a patient in a corridor in your office, do you smile and say “Hello”? Or do you look the other way? What about when you pass another teasm member in your corridor? Do you smile and acknowledge them? And what if a patient is with them and sees you do this? When you enter a treatment room and other team members and patients are in there, do you excuse yourself and acknowledge each and every person in that room? If you don’t, why don’t you? How hard is it to stop and say “Hello” to everyone in the room….and I mean *EVERYONE*!! And that is, that if another person comes within five feet of you, then you *MUST* acknowledge them. As I visit dental offices around the world, I’m shocked at how often I see dental office team members flagrantly ignoring customers and other team members. Who wants to be known as an ignorant employee? It’s not a badge of honour I’d want to wear. What’s the purpose of being in business? Well, there are three purposes. Why would you bother ever going into business without looking clearly at the purposes of being in business? There is no point in going into business if the rewards for doing so are insufficient to repay you for your investment in both time and money, as well as to repay you for your risk. Otherwise you may as well just keep your job, where you are paid a paycheck for turning up, and you’ve never needed to put your capital at risk or your time and effort into that risk. A lot of dentists forget this important fact when running their businesses. They fail to take their business seriously. They fail to realise the time and money they have invested in getting to where they are, and that if that time and money had been put into another investment, then that investment would be returning a dividend or a rental income. The purpose of being in business is to grow the business and sell that business for a profit. Along the way, the business needs to provide you with sufficient reward that you can invest to provide for you to retire with a lifestyle worth living. Some businesses will do this for the entire lifetime of the owner. At other times, a business will only be profitable and viable for a shorter finite period of time, and so the business needs to be looked at as a stepping stone to bigger and better things. Some business owners enjoy that thrill of the chase, and the movement from one big project to the next, as they sell and buy businesses. Other business owners look at their business as a career life time choice. Either way, the purpose of each business is for you to financially profit from owning the business. What’s the point of being in business if you have to scrape and scrimp along the whole way? What sort of a life is that? The point of being in business in the first place is to reward you along the way for the ownership of that business and what that business provides back to the community, and to allow you to lead a comfortable life along that way, as a reward for your owning the business. Why would you want to own a business and then go without? Purely because you owned that business? To me that makes no sense…. Importantly, having a better lifestyle that you lead allows you to invest into your community purely as a result of having that ability to spend a little more. 4. Provide employment in your community. One of the benefits of owning a business is that the business then provides employment opportunities for your community, both with jobs within your business as well as in ancillary businesses with whom you do business with. Owning a profitable business allows you as the business owner to be more philanthropic, and to give back to your community. If you are owning a business and your business is not ticking all five of these boxes, then you need to evaluate the reasons as to why you are in that business at all…..